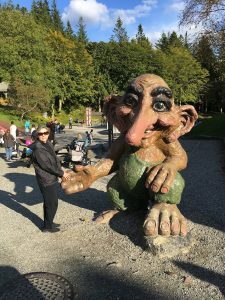 Recently we revisited Bergen, Norway. We had forgotten what a delightful city it is. Whenever you have mountains down to the sea, you know you have the perfect formula for a special experience. Bergen is such a place. Our September visit brought us not only beautiful scenery but great weather as well. Natural beauty, history, interesting architecture and activities, by land and sea, abound. For those who like sailing the waters, you couldn’t find a lovelier fjord. Bikers and hikers have endless mountain trails, starting at the top of Mt. Floyen. And for those who want to see the scenery with less work, there is a funicular conveniently located in the middle of the city that will whiz you to the top in minutes. I love the feeling of rising above the land as a scenic panorama unfolds in front of you. Every lake, bay, park, historic and landmark location lay in front of you like a miniature map. What a great way to scope out the city and select your next adventure. And while you at the top, why not stay for dinner and soak in the view as the sun sets. There are several restaurants from which to choose. 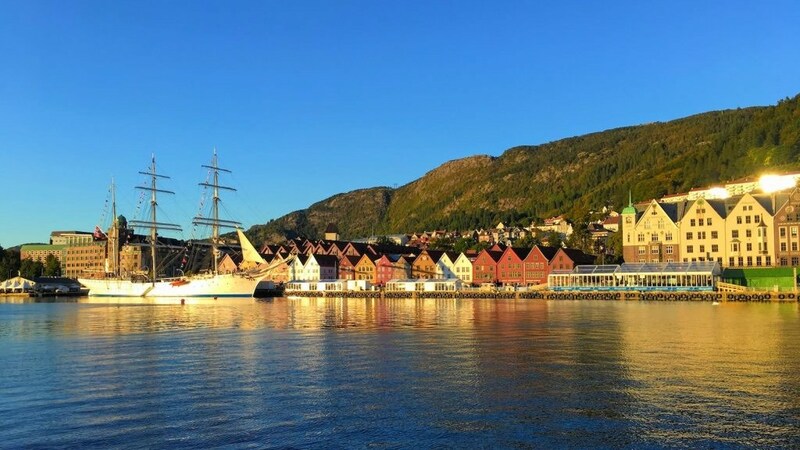 For history buffs, Bergen was the center for the Hanseatic traders centuries ago. The colorful wooden row houses along the waterfront house the Bryggen, with interesting shops and restaurants, and the historic Hanseatic Museum is located close by. Not far from there is the majestic Fredricksberg Fortress and St. Mary’s Church—one of the oldest buildings in Bergen, constructed in the 1100s. Be sure to peak inside, you will be glad you did. On the outskirts of town, you can visit the tranquil home of musician Edvard Greig. You will see why the location of his home inspired beautiful music. Bergen is a very walkable/bike friendly city. As a matter of fact, there was an international biking event the weekend we were there. Beautiful parks are scattered around the city and make for picturesque rest stops as you hike around. The architecture has something for everyone, spanning several centuries, from wooden to glass and steel ultra-modern structures. The city also abounds with every kind of restaurant. One of the best places for people watching and a fabulous seafood meal is the Fishmarket right on the waterfront. Try the stone crabs, they are to die for. We stayed at the Clarion Hotel Admiral on the waterfront and found it to be an ideal location for touring with comfortable accommodations. You are in walking distance of most of the central sites and the harbor for scenic boat trips. It’s also close to shopping, eating and the funicular. If you happen to be embarking on a cruise from Bergen, be sure you get there a few days early so you can soak in all the city has to offer. Don’t miss this Norwegian gem.